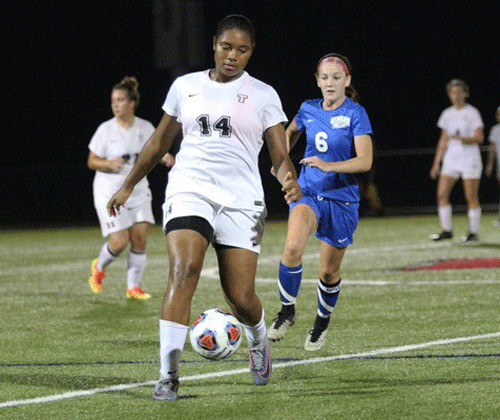 Taznae Fubler and her Thomas College Women's Soccer teammates came back from a 2-0 deficit to take a 4-2 victory over UMaine-Farmington in a North Atlantic Conference (NAC) match. UMaine-Farmington went up 2-0 in the middle part of the first half, with goals from McKenna Brodeur in the 29th minute and Lydia Roy in the 34th minute. Katherine Hoving put Thomas on the board late in the first half with her goal in the 45th minute making it 2-1 going into the break. Thomas tied it up in the 55th minute when Cassie Contigiani found Nikki Bradstreet to make it 2-2. Bradstreet gave Thomas the lead in the 63rd minute on a goal assisted by Fubler. Hoving added an insurance goal for the Terriers in the 78th minute off a feed from Contigiani to take the 4-2 win. Kayla Gordon made six saves in net for Thomas to earn the win. Mikayla Cameron took the loss for Farmington, allowing four goals.